In last month’s survey, just 22.2% of economists expected the Fed to begin shrinking its portfolio this year. Fewer than a quarter of economists in the latest poll expected the Fed to wait until the first quarter of next year to start to whittle down its portfolio, compared to a third last month. In recent weeks, Fed officials have said they are discussing plans to start gradually reducing the large bondholdings the central bank accumulated during and after the financial crisis through asset-purchase programs aimed at lowering long-term interest rates and boosting economic growth. The Fed wants to shrink the balance sheet to an undetermined size now that the economy is growing moderately, although officials haven’t decided exactly how to do it or when to start. The central bank currently reinvests the proceeds from its maturing assets, and could decide to taper the pace of those reinvestments over several months or cease them altogether. Fed Chairwoman Janet Yellen and other senior officials have stressed that they want the process to be gradual and predictable. “Expect the Fed to announce tapering strategy details at the December meeting with reinvestments beginning to decline in January 2018,” Deutsche Bank Chief U.S. Economist Joseph LaVorgna said in the latest WSJ survey. Some of the business and academic economists polled this month said they view shrinking the balance sheet as complementary to tightening monetary policy through gradual increases in the Fed’s benchmark short-term interest rate, the federal-funds rate, since shrinking the balance sheet would likely cause long-term rates to rise. Gregory Daco of Oxford Economics expected the Fed to hold off on raising rates in the final quarter of this year once it begins addressing the balance sheet. “The Fed is eager to mop up excessive liquidity,” he said. On interest rates, most economists surveyed expected the Fed to hold short-term interest rates steady at its May 2-3 policy meeting, and next raise them in June. Fed officials raised the fed-funds rate last month by a quarter percentage point to a range between 0.75% and 1% and penciled in two more moves this year. 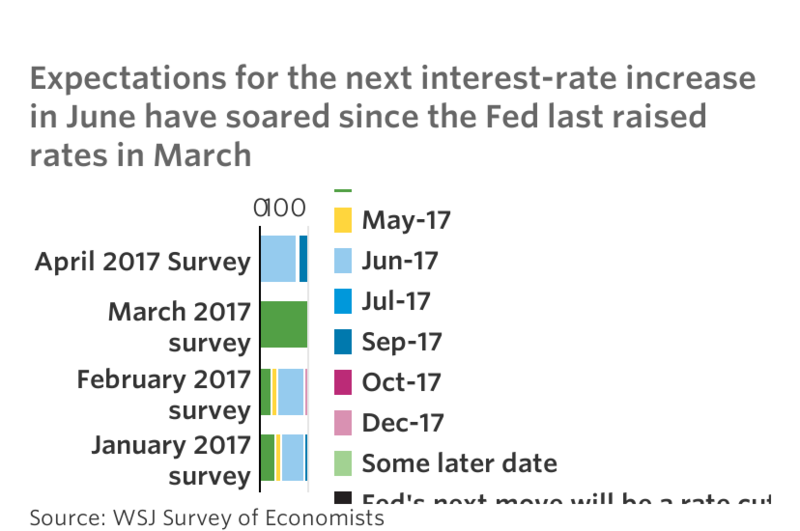 Nearly 80% of the economists surveyed expected the Fed will raise rates at its June 13-14 policy meeting, up from nearly 70% in last month’s survey. Just two out of 61 economists polled in April expected the next rate increase in July, 10 expected it in September and only one predicted officials will hold off until December to next raise rates. While most economists forecast the next rate rise in June, they were divided over when the Fed will move after that. More than half, 55.7%, expected the central bank to increase interest rates to a range of 1.25% to 1.5% in September. Just under a third, 31.1%, expected the third rate increase of 2017 in December. Economists saw just an average 14% probability of a rate increase in May. The Wall Street Journal surveyed 61 economists from April 7 to 11, but not everyone answered every question.